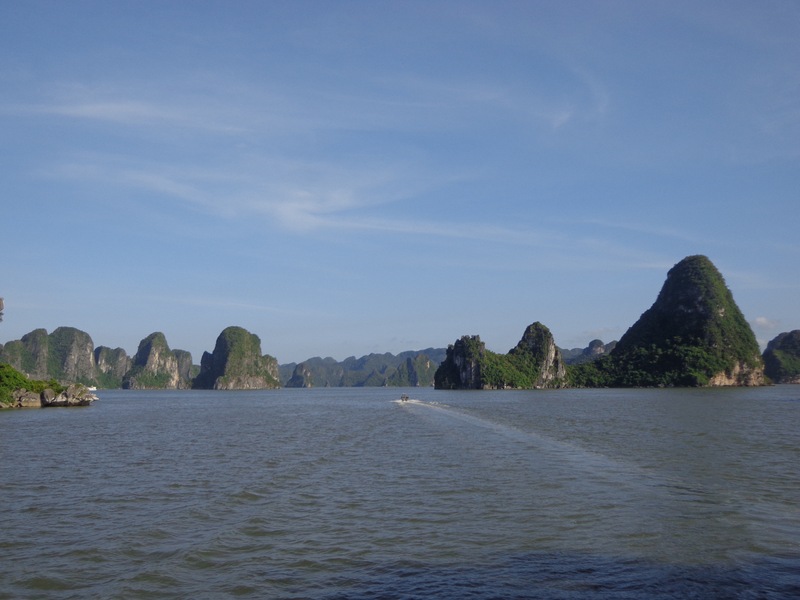 Ha Long bay is a popular tourist destination in the Northern part of Vietnam. In order to avoid the hassles of permit, we decided to book a package. Every hotel / hostel / travel agency has the same brochure. It is advisable to not go with the prices mentioned on the back. 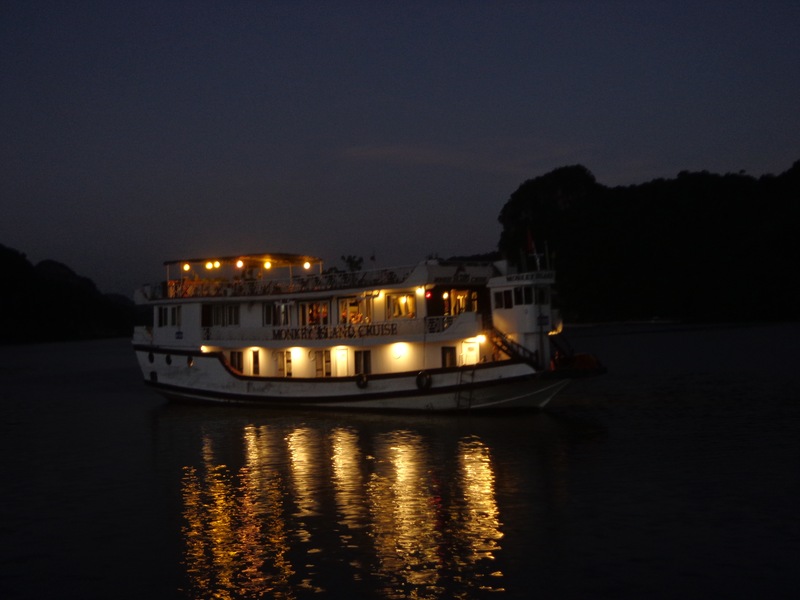 We paid 73 USD per person for the trip inclusive of all tickets, permit, transport, lodging, food and drinks. Later we got to know that the other guys on our trip paid varied fees. Nearly all of them paid about 20-30% more than what we had paid. 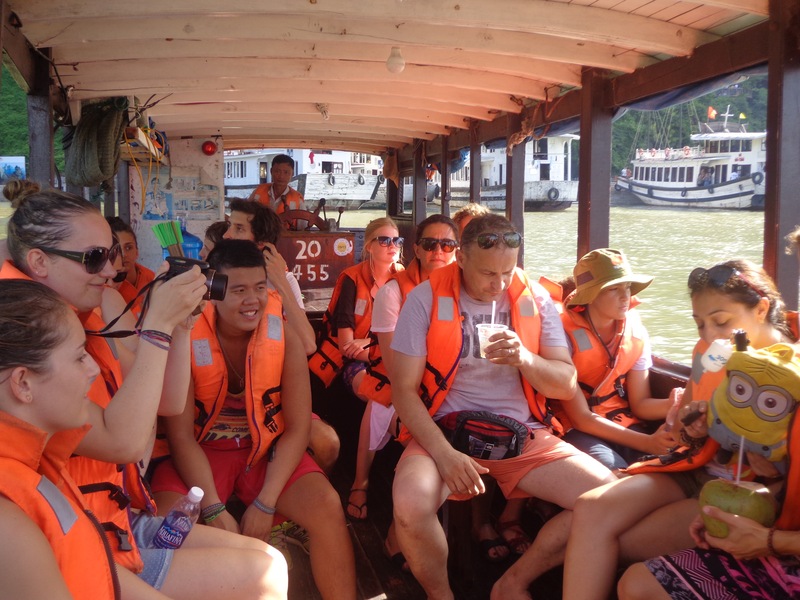 It is best to look around and get the best prices for the same trip. Our guide for the trip was Phuong. He gave us a nice history of Vietnamese culture and French influence (oppression) on the land in his heavily accented English. It was a weird situation since 10 of the 27 people on the bus were French. The trip was about three and half hour long. This was because there is a government imposed speed limit of 50 kmph. After a brief explanation of safety rules and itinerary, we got mildly comfortable in our seats. 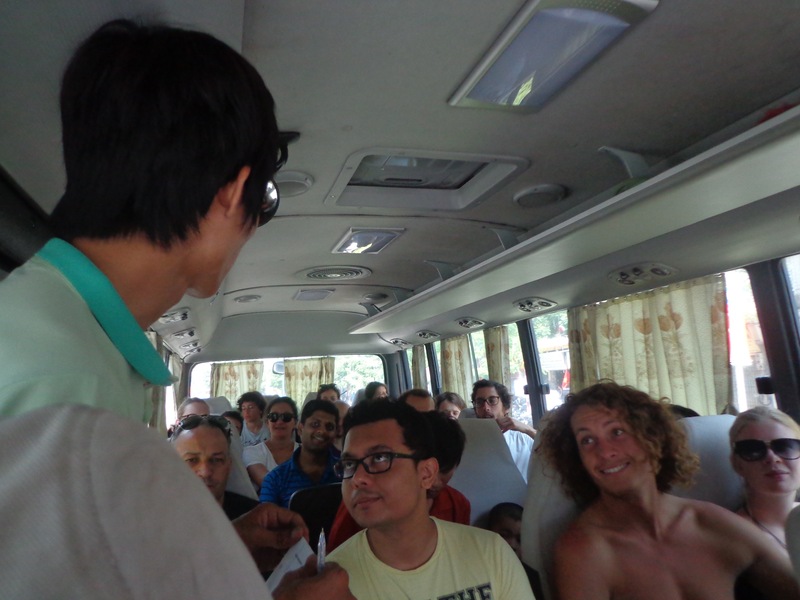 Phuong, our guide introduces himself and the trip itinerary on bus. I got to know about the poverty situation in Vietnam from Phuong. He himself is a licensed tour guide and is working towards his international guide permit. He needed some five years of study of which he had completed two. His parents are poor farmers who hail from Northern Vietnam. It was difficult for them financially to educate Phuong, who is one of six children. Being a socialistic country, government imposes a lot of tax on imported goods. Basic roads are not up to the mark and hence, government puts a duty of 100% on cars. (It used to be 200%.) I wonder what would Vietnamese government say about Indian roads. From what I have seen, roads here are much better and less congested than what we have back home. Nonetheless, this was one of the reasons why I have seen a lot of scooters around Vietnam. In rural areas, a family of five might have only one scooter to get by. Cars are for the rich. Our minibus stopped midway to give us the opportunity to freshen up. I had some Vietnamese coffee (I am getting a hang of it.) Judging by the way the rest-stop is setup, it is evident that the primary aim of the place is to milk money out of tourists. 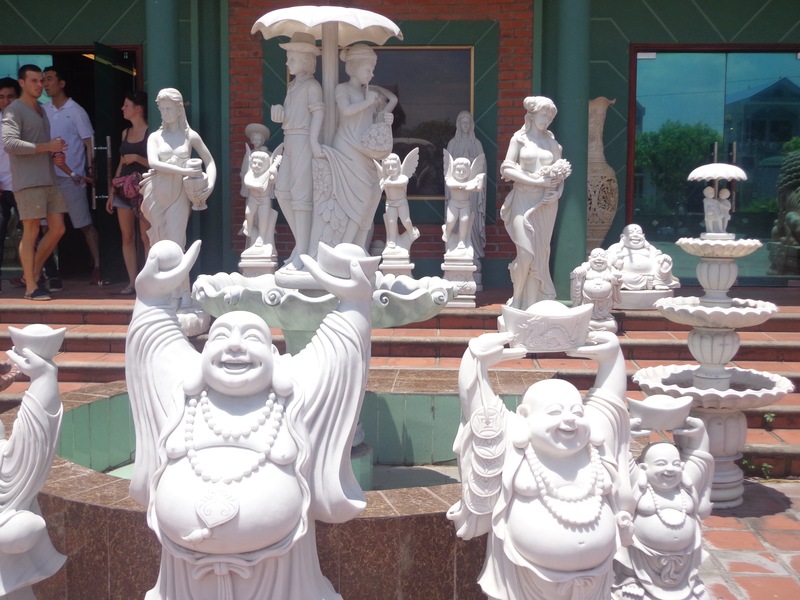 There are huge, heavy and expensive decorative items that are kept for sale. I wonder how a tourist, who decides to purchase these large installations, would be able to carry them back home. 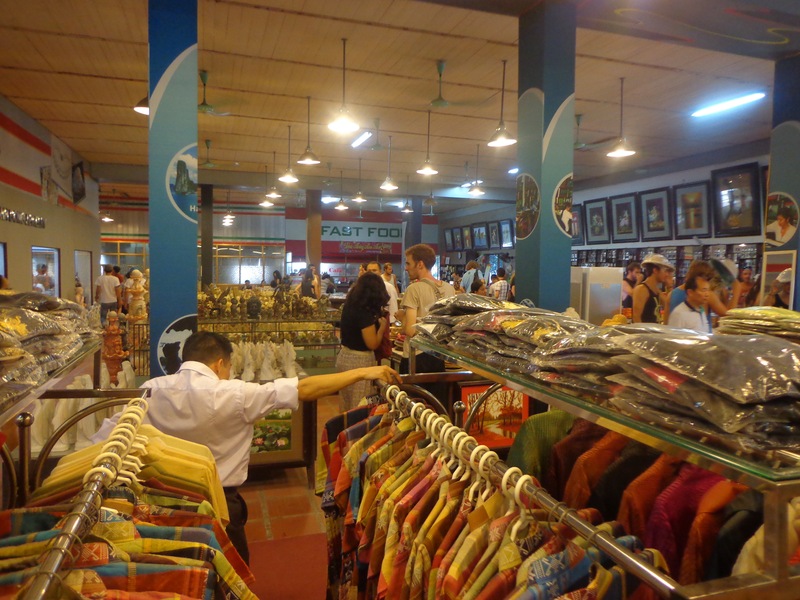 This rest stop sells a lot of stuff – clothing, paintings, crockery, etc. Judging by the price and the items, these are strictly for tourists. Phuong took care of the tickets and permit. 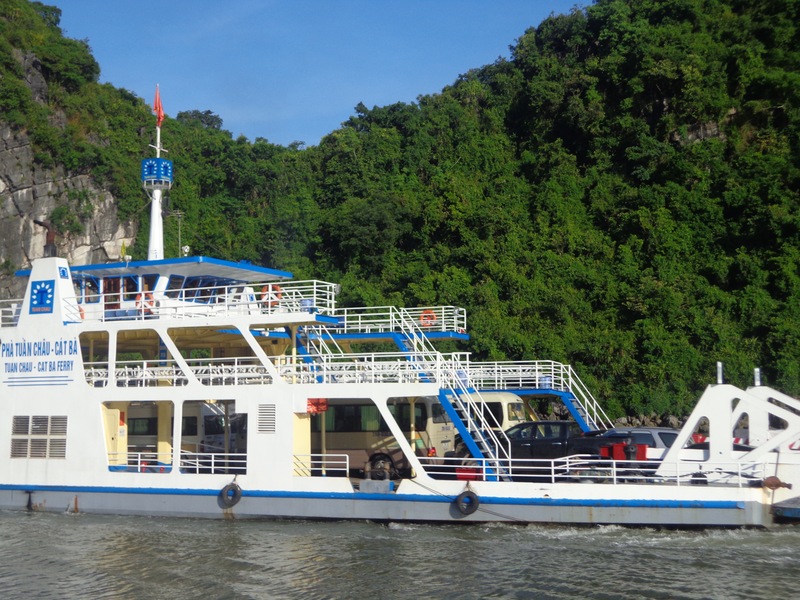 We used a motorboat to commute from the Ha Long city harbour to the lodging vessel, which required deeper waters to anchor. 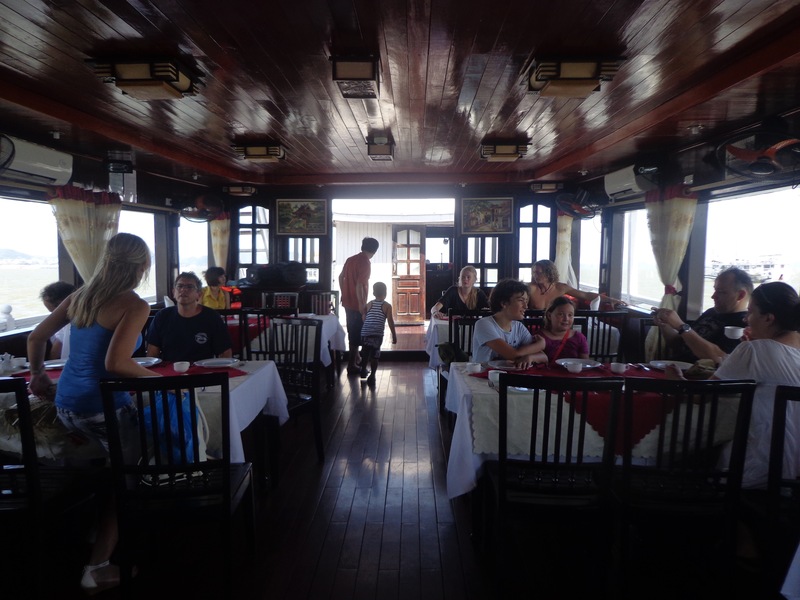 We were served a welcome drink and some decent lunch before heading towards the Ha Long caves. 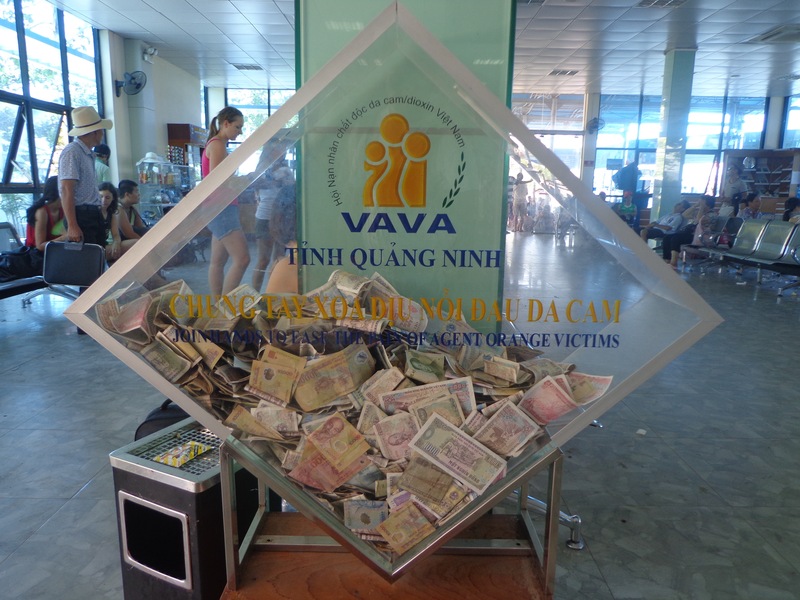 A collection box seeking donations for the victims of Agent Orange. 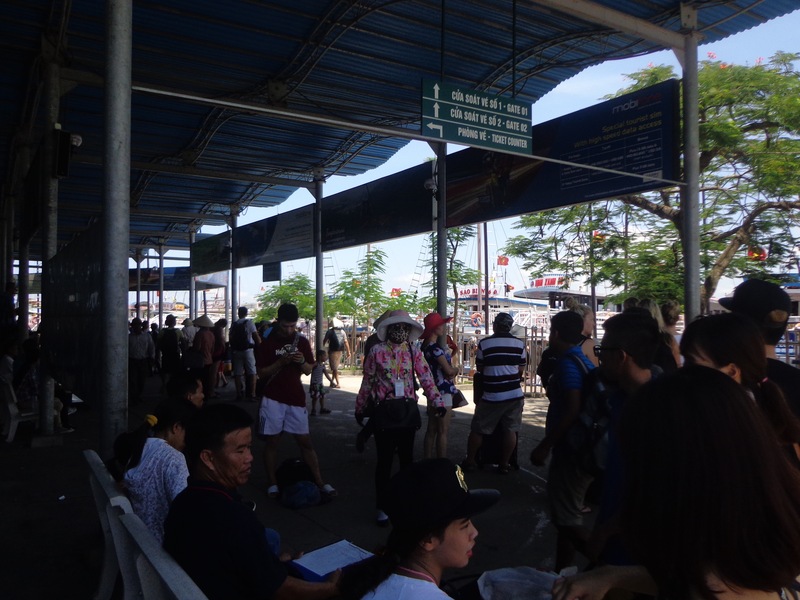 Our group being transported to our lodging vessel. 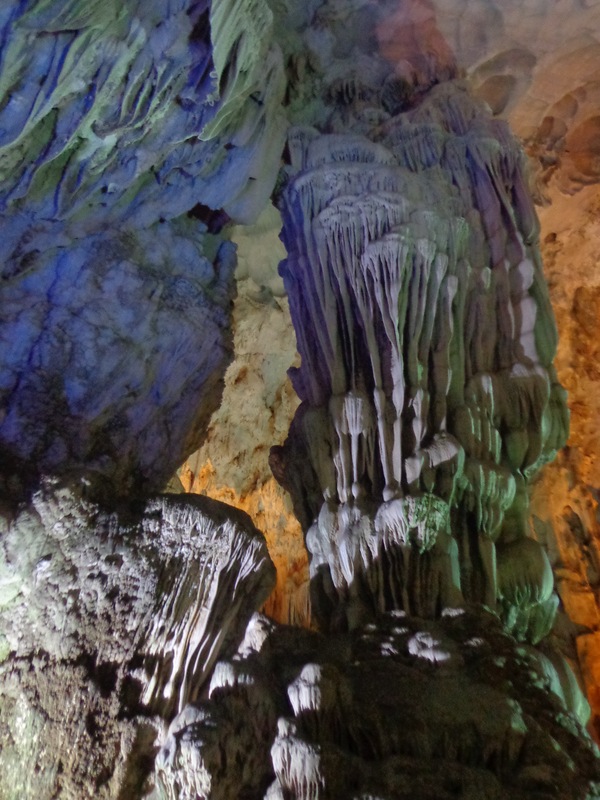 Ha Long caves (on Monkey Island) are huge formations of stalactites and stalagmites inside a hollow limestone hill jutting vertically from the waters. 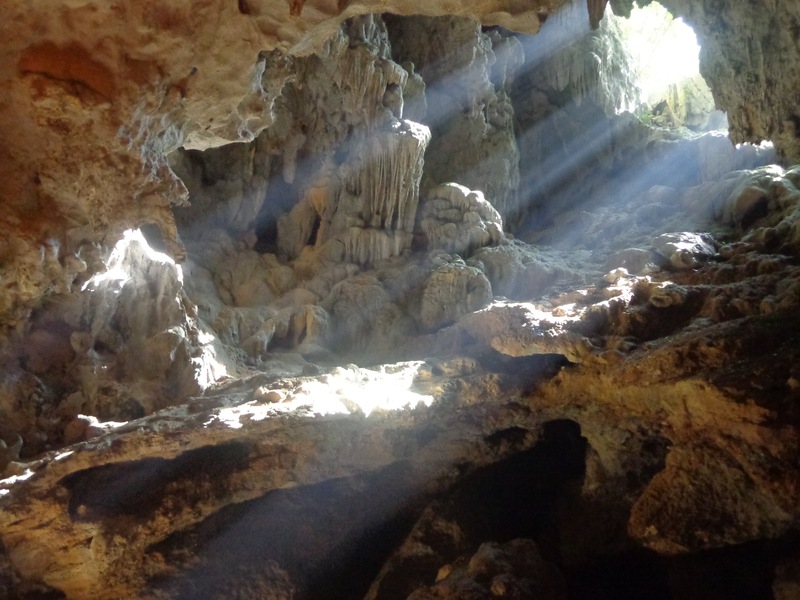 The cave was hidden from human beings since the only access point was through an inaccessible opening at the top of the hill. Since its discovery, the government has created lateral openings for entry and exit and has also paved a way for visitors to traverse without spraining their ankle. A word of caution here. It is best to wear a pair of bathroom style flip-flops with good grip on smooth wet surface lest you find your bum impacting the surface itself. 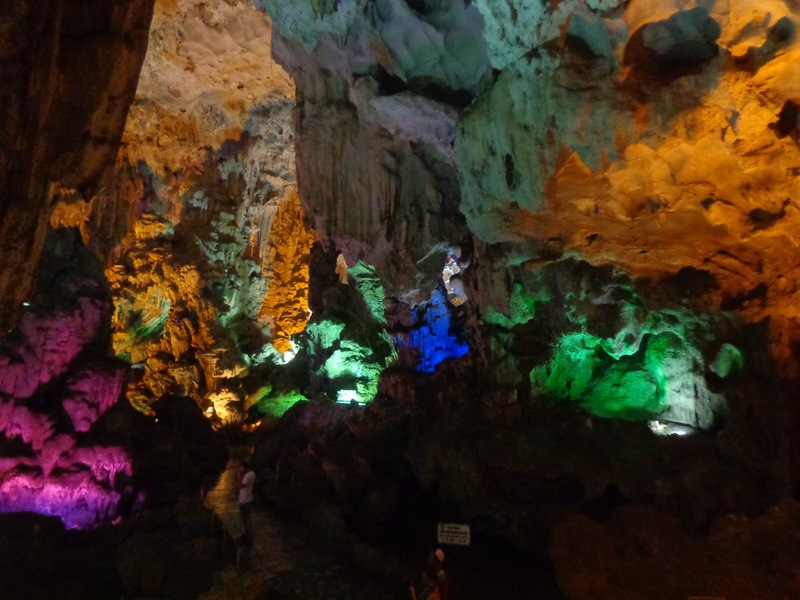 This is the natural opening which opens into Ha Long caves. 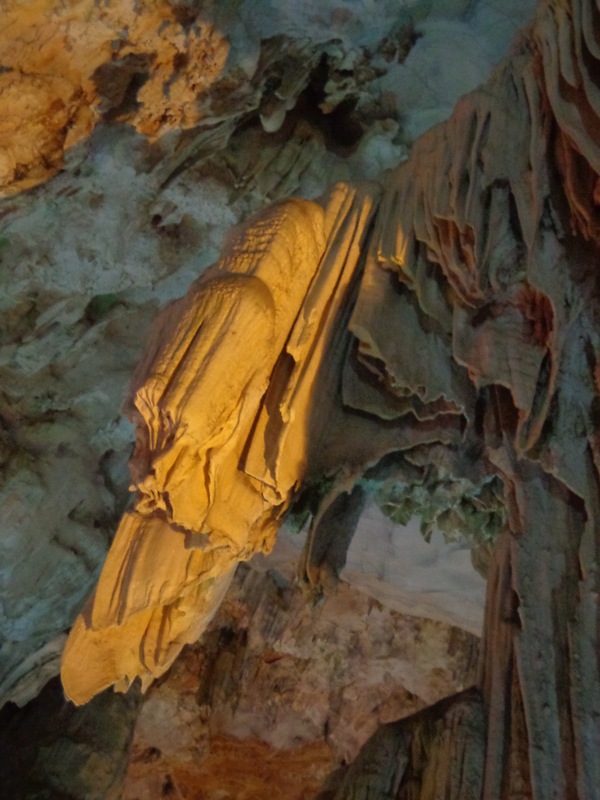 Here are a few photographs of the stalactites and stalagmites. 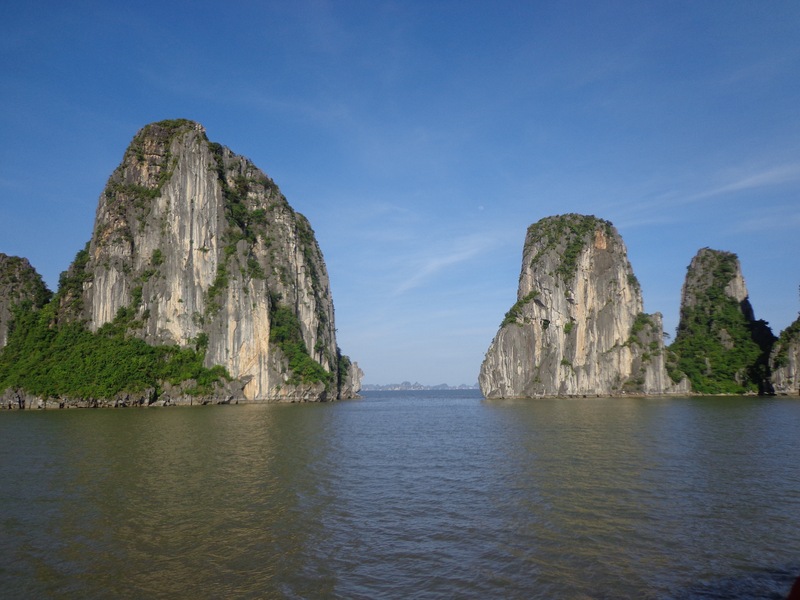 Phuong explained the turmoil of the families who lived in Ha Long bay. These families traditionally earned their livelihood from fishing, diving for pearls or catching shellfish. The ecological shift has caused the number of fishes to diminish over the years. Fifty years ago, a fisherman could catch tons of fish everyday. Nowadays, if they are lucky, they would get fifty kilos of fish. Often times they come back with much less. Government has been driving these families into the mainland by providing them with alternative employment and giving them places to stay. Government cites pollution and shift in ecosystem as the cause of this movement but true motives might be different. I might not be in a position to comment much about this third hand information. 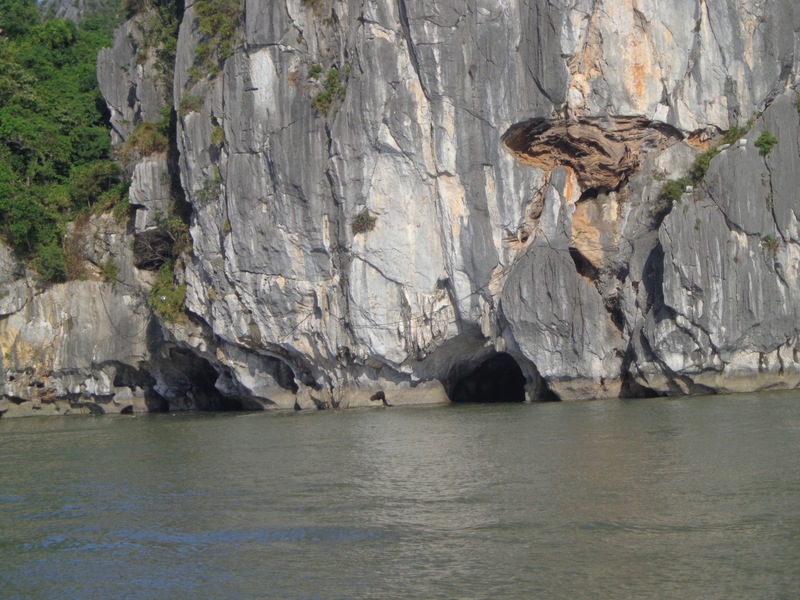 The anchoring point was about 45 mins from the Ha Long caves. The temperature was 37 degrees and humidity must have been about 90%. We sat on the corridor outside our room to grab some cool but humid breeze. 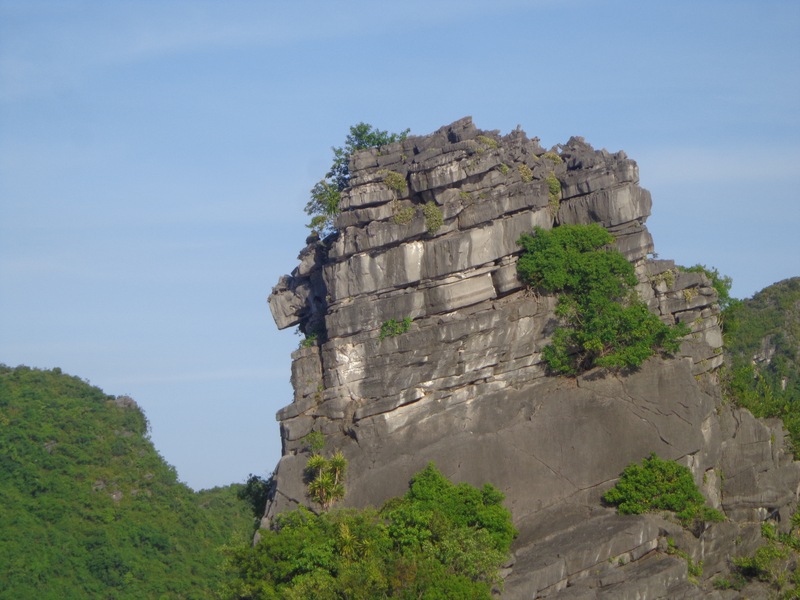 En route, I came across many nice rock formations and scenic beauty. Interestingly, we also saw a vessel ferrying cars across the bay. 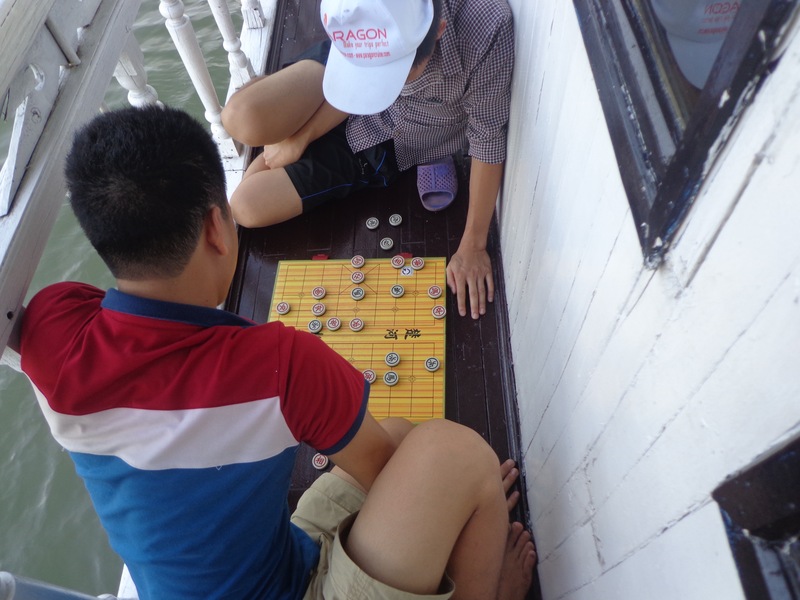 The crew members were busy playing Chinese chess and fishing. Some of them chilled out on the front deck with some local cigarettes. Crew members playing Chinese chess (Xiàngqí). 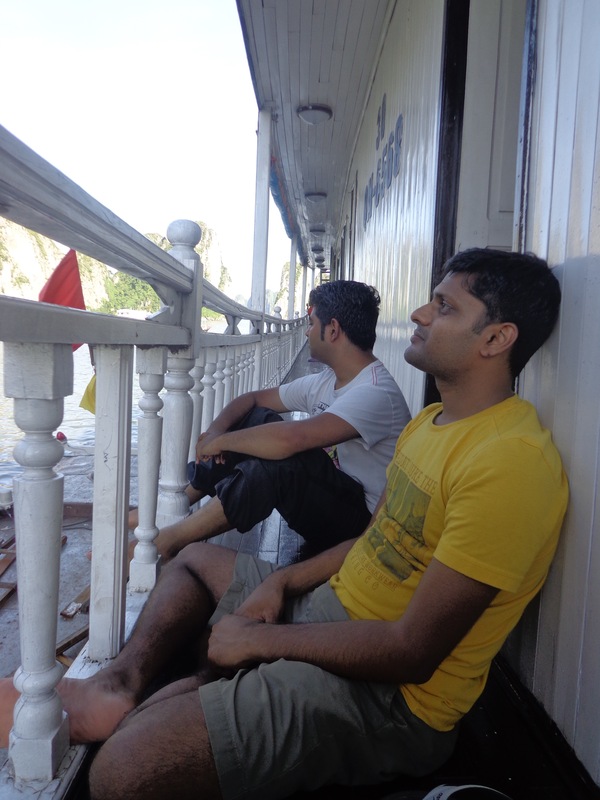 And this is me and Mogit doing nothing. We got the best room even considering the fact that we paid the least. Ours turned out to be a very wide room with a nice bath area and four beds (even though we had asked for a three bedroom cabin.) It was also on the second floor where the ventilation is better. That was kind of a huge plus as the room ACs operate between 7.30 pm to 7.30 am only in order to conserve fuel. The food was very westernised. Maybe they have considered the fact that most people come from America and European countries. The dining hall of the vessel. The food was too western for me to snap and post some pics. At night we got to socialise with a Croatian couple who came with their son and daughter and a New Zealand couple who were on a 12 week backpacking trip in Southeast Asia. The Croatian couple’s son had asked his father, “Dad, why are these men talking like Raj?” Apparently, he was referring to the accent of Rajesh Koothrapalli from The Big Bang Theory sitcom. A neighbouring vessel. I believe our vessel would look the same. In fact, all vessels looked the same.